Vital educational resource on the human element launched. A vital global educational resource on the human element is launched today (Wednesday) for the benefit of the whole maritime industry. 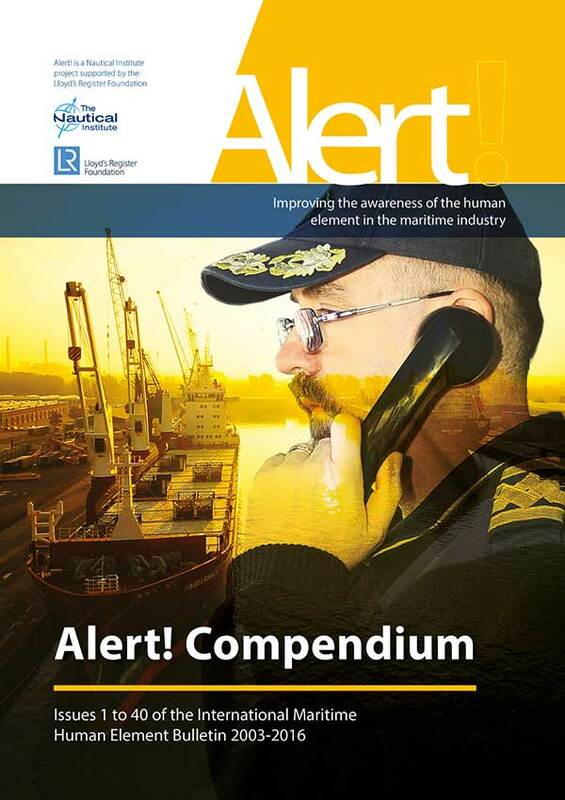 Lloyd’s Register Foundation and The Nautical Institute have joined together in producing a special limited edition bound set of all 40 issues of the Alert! human element bulletin. Enough have been produced for every maritime training college in the world to have a copy so all will have access to the topics and case studies covered by the project over its 14-year history. The volume acknowledges the “enduring significance” of these topics and the continued role of the Alert! bulletins in helping to improve safety at sea, said Professor Richard Clegg, Foundation Chief Executive, Lloyd’s Register Foundation, which has funded the project. As a result of the project some 2.5 million of the four series of Alert! bulletins comprising 350 articles had been distributed around the world; 21 innovative videos were produced for free download and a reference library of 250 papers has been made available online. “Collectively they form a vital global educational resource for the maritime community; unique within any industry and actively used to promote safety at sea,” said Professor Clegg. One of the strengths of the project was that it looked at all parts of the industry and their effect on the design and different aspects of operation, showing how human element principles can be applied at all stages in the design, operation, updating and maintenance of any ship and its systems. “This bound set contains all the Alert! bulletins and the descriptions of human element competence developed by the project,” explained Dr Jonathan Earthy, Human Factors Coordinator, Technical Directorate, Lloyd’s Register Marine and Offshore. He described how the project was made up of seven closely related projects – four series of the bulletin, each with a different theme; the website with its large library of reports; video versions of series 1 and 2 of the bulletin and the development of a human element competence model submitted to IMO. John Lloyd, CEO of The Nautical Institute added: “The real success of the project will be seen in years to come in better design of ships and their equipment based firmly on the human element principles set out in Alert! bulletins.